It's hard to mistake one of these fellows. He looks so unique! The Triceratops was one of the last large dinosaurs. Despite being an herbivore, it had a total of up to 800 teeth, which constantly grew back! Nonetheless, it was incapable of chewing food, because its jaw could not move from side to side. Instead, it used these teeth to cut up palm leaves and ferns. 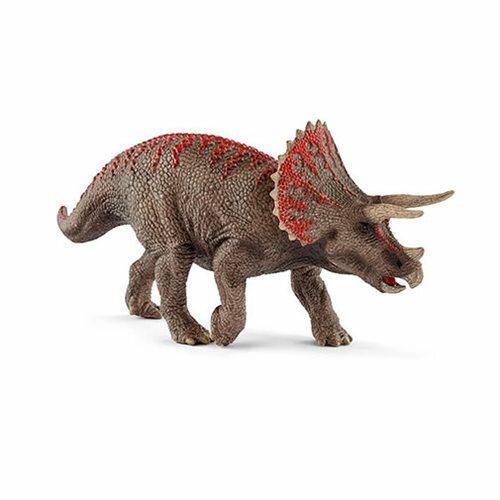 Here, the uber-detailed Schleich Dinosaur Triceratops Collectible Figure measures approximately 8 3/10-inches long x 3 9/10-inches tall and looks just like the big guy that lived about 66 to 68 million years ago!